A father and his two daughters are recovering after witnesses say they were beaten by a large crowd after a Memorial Day barbecue in an attack they believe was racially-motivated. A Bucks County man, who we are not identifying, told NBC10 the incident was the culmination of several months of bullying. The man’s mother, sister, brother-in-law and four nieces and nephews, between the ages of 7 and 12, live at a home on Lawndale Street in the Juniata section of Philadelphia. The father told NBC10 his sister’s family is the only white family living on the block and that for the past year the children have been the victims of racially-motivated bullying, name-calling and attacks. The father also says his own children, his 6-year-old son who has autism; 12-year-old daughter who has Asperger's syndrome and asthma; and 14-year-old daughter who has Type-1 diabetes; have been the victims of bullying whenever they visit. The bullies are mostly kids and teenagers as well as some adults, according to the father. He also said during one incident bricks were thrown at the children. The father insisted however that it wasn't the entire block bullying his family and that some neighbors have come to his family's defense. The father and his kids were visiting his mother's home on Lawndale Street Monday around 5:30 p.m. during a Memorial Day cookout when he says a large group of people on the block kept going to the house and harassing his family. He also says one child pinched his daughter. Not wanting the situation to escalate, the father says the family tried to leave. That’s when a group of around 20 people, mostly women and teenagers, tried to pull the man’s brother-in-law and mother off the porch, according to witnesses. The father then says they began to attack his two daughters. One woman also grabbed his 14-year-old daughter’s hair and pulled her head against a railing, according to witnesses. As the crowd attacked, the father told NBC10 a man with brass knuckles began to beat him. The father says he fell to the ground, struck his head on a railing and the attack continued. 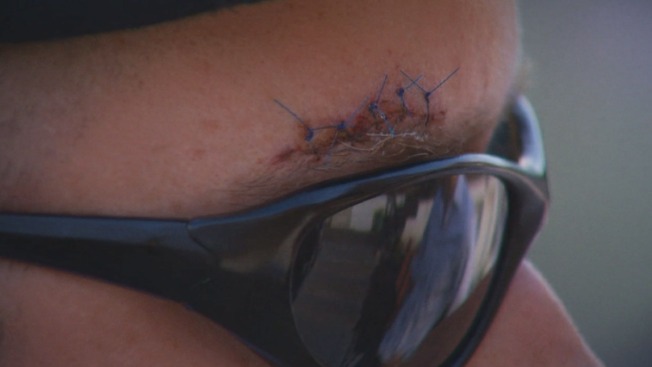 "When I went to the ground someone was kicking me and punching me," he said. The father says the man then began to attack his daughter as the woman continued beating her. "He proceeded to turn around to my 14-year-old daughter to the step up there and beat her in the back of the head," said Patricia Whitaker, the man's ex-wife and mother of his three children. A witness called 911 and the crowd finally dispersed. The father, who told NBC10 he lost consciousness at one point, was taken to Aria-Frankford while his daughters were taken to St. Mary’s. They were all treated for head trauma and later released from the hospital. Tuesday night, several residents on the block spoke to NBC10 and insisted the incident wasn't racially motivated. "If they said we're racist it's a whole bunch of crap," said one man who did not want to be identified. "It's not right. It's going to cause a lot of chaos around the neighborhood." The neighbors also claimed the father started the fight. Police told NBC10 they are investigating the incident though no arrests have been made as they continue to interview witnesses.